What to Expect From the New iPhone Lineup Coming This Fall! Apple will introduce three new iPhones later this year. While the exact date of release has yet to be announced, Apple typically sends out invitations in late August for their fall iPhone events. These events usually take place at the beginning of September, with most official launch dates occurring about a week-and-a-half later. 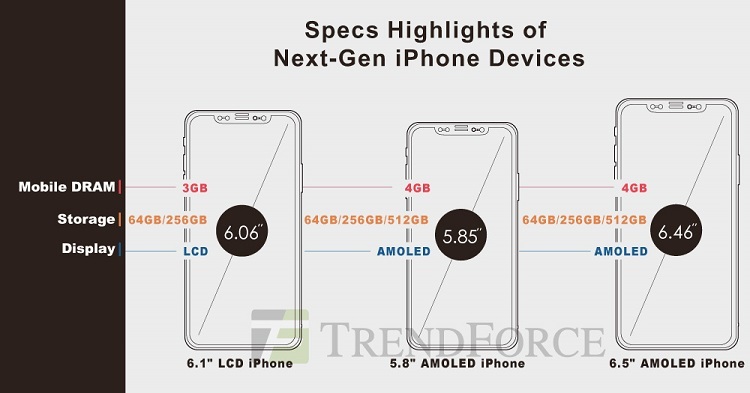 Of the three new iPhones being released, one will be a budget, 6.1-inch LCD version. This one will come with a larger screen than the iPhone 8 but with a similar price. It will include Face ID and Dual-SIM function. It is estimated the price will start at between $699 and $749, with upgrades available. For cost purposes, the 6.1-inch LCD model will have a single-lens camera. This less expensive iPhone is expected to be the best-seller among the trio being released. Sources believe that two AMOLED iPhones will become available: a 5.8-inch version and a 6.5-inch version. The 5.8-inch model is thought to be a follow up to the iPhone X, whereas the large 6.5-inch model is currently being dubbed the iPhone X Plus. One of the new models is expected to feature a rear-facing camera with a triple-lens array. This would improve the iPhone's zoom capacity and picture quality, particularly in dimly lit environments. You will be able to upgrade storage to 512 GB, and support for the Apple Pencil stylus is also expected. Investment analysists are predicting that these phones could start at $1,100. All three phones will likely have Face ID and could even omit the fingerprint sensor. The 6.1-inch LCD iPhone will probably be housed in an aluminum frame. The two more expensive OLED iPhones are rumored to feature more durable stainless-steel housing. Meanwhile, iPhone X will likely be discontinued as its sales have not been as high as Apple had hoped.